Manure lagoons and containments are becoming an important resource and there are many new products being developed for manure containments. Layfield has been involved from the beginning with odor control/biogas collection covers and we have a number of unique designs for all sizes of containments. We also supply and install geomembranes for manure lagoons, compost pads, and other water storage reservoirs and lagoons. 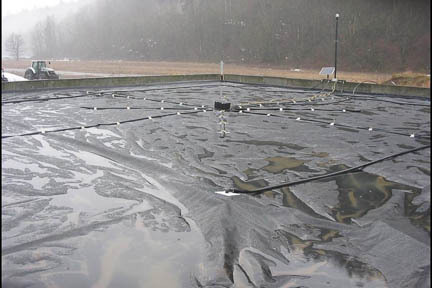 Layfield’s featured product is the REVOC Biogas Collection cover which is used to capture biogas from manure lagoons for other uses. We have cover designs for large lagoons and a specialized design for a prefabricated cover for smaller lagoons. Layfield’s Enviro Liner series of geomembranes are also ideal for manure containments.